Maynard Dixon’s ability to capture the West and its inhabitants, in a nonjudgmental and honest way, has left an indelible legacy. The Maynard Dixon Museum, while not in New Mexico, is a little less than an hour flight from Albuquerque to Tucson Arizona. “The hundred dollar Southwest flight is well worth it,” says Dr. Mark Sublette who is the Museum’s founder and Maynard Dixon expert. Sublette goes on to say “The Museum has tried to capture the essence of Dixon, the artist as well as the individual, through not only his artwork but through his letters and poetry.” Sublette’s Maynard Dixon Museum, the only museum dedicated to the lifework of Maynard Dixon, has succeeded in that goal. Over a hundred pieces of artwork including paintings, drawings, and original Maynard Dixon ephemera can be seen at the Museum. The Maynard Dixon Museum, located within Medicine Man Gallery on Tanque Verde Road in Tucson, is a treasure trove for those who love Dixon. Dixon’s original easel resides in the museum. Many artists have made the pilgrimage just to see his easel with its copious drips of blue paint. Dixon’s easel, with its Pollock like surface, succinctly captures a fifty-year time frame of Dixon’s innate color sensibilities. Numerous original vintage photos by Dixon’s second wife Dorthea Lange can also be found in the Museum, along with a lovely vintage photograph of Dixon taken in 1944 by Ansel Adams. Ansel gave the photograph to the Dixon family, and it now resides permanently in the Museum. Edith Hamlin, a well-known artist in her own right and Dixon’s last wife, is also represented in the Dixon Museum collection. For the bibliophiles, nearly one hundred original books, magazines, and sunset magazine covers are on display. If time or travel is problematic, and you can’t visit Tucson while in New Mexico, you can always visit Mark Sublette at his Medicine Man Gallery location at 602A Canyon Road, Santa Fe. The gallery always has excellent examples of Maynard Dixon’s artwork on display. 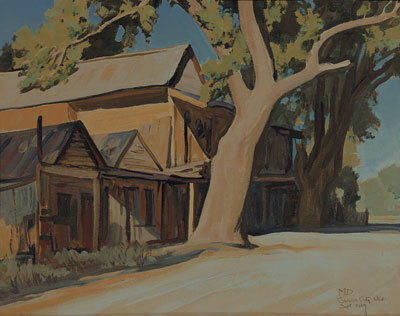 You can visit the museum online at either www.maynarddixonmuseum.com or for in-depth information regarding Maynard Dixon visit www.maynarddixon.org. This article was excerpted from Canyon Road Arts: The Complete Visitors Guide to Arts, Dining and Santa Fe Lifestyle, Vol 4, 2008-2009, page 46. Canyon Road Arts is published by Medicine Man Gallery. All rights reserved.